Thank you for visiting our site. The Cape Fear Orchid Society is an organization open to people who love orchids and enjoy growing them. Whether you just bought your first orchid and have no idea how to care for it, or you are a seasoned grower and enjoy showing orchids, the Cape Fear Orchid Society offers something for everybody! Our varied meeting speakers and our members allow for a learning experience in a friendly and social atmosphere. Our monthly meetings are usually scheduled on the second Wednesday of the month at 6:30 PM. Most meetings are held at the New Hanover County Arboretum Auditorium at 6206 Oleander Drive, Wilmington, NC (click on highlighted link to access map information). See next meeting info below on this page. 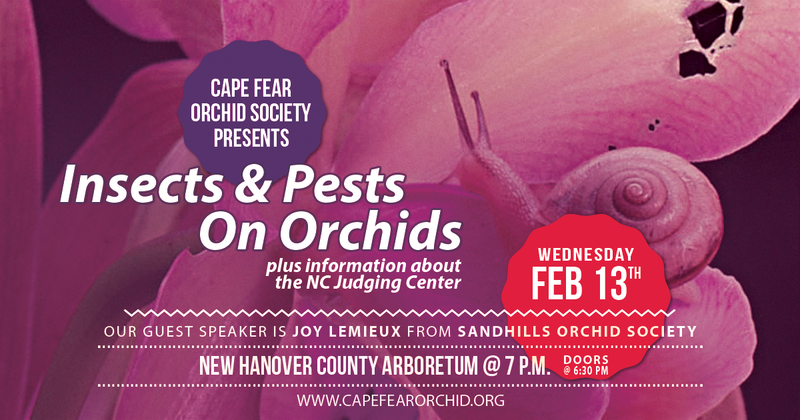 "Insects & Pests on Orchids"
Join us Wednesday night as we welcome back Joy Lemieux of the Sandhills Orchid Society to share her extensive knowledge of orchid insects and pests as well as her experience as an AOS judge with the Carolinas Judging Center. Joy has been growing orchids for 20 years and currently has about 500 orchids in her greenhouse. Her first orchids came from her mother who had little faith in Joy’s green powers. She mostly grows Cattleyas and Mini-Cats, but is branching out to Dendrobiums, Lycastes, and Stanhopeas. She is an American Orchid Society (AOS) certified judge with the Carolinas Judging Center. JANUARY 16 – Tom Wise "BAKER'S DOZEN: My Top Thirteen Orchids for Southern Growers"
FEBRUARY 13 – Joy Lemieux "Insects & Pests on Orchids"
Please visit the CFOS Facebook page for additional information or continue to check out the other pages on this website.